This is a Antique Victorian Day Dress. It's a beautiful floral print accented with purple that I believe is silk. It's a very small size so please see measurements below. It has been hand stitched and the skirt is very full so it accommodates a hoop. 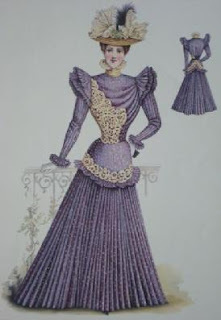 The high neckline is finished with the purple ribbon. The modesty panel has eye/hook closures behind it. The skirt is lined and there is a velvet banding that goes around the bottom perimeter of the skirt along with something that is inserted in between the fabric and lining. I suppose it is to add weight to the bottom of the skirt (it's 7" in height). 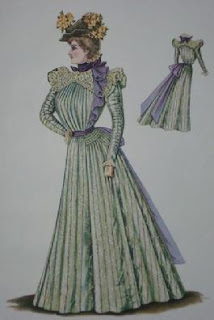 Gathered pleating at back of skirt, Ruffle with lace at bottom and the same ruffle with lace is at the end of each sleeve. Please take a look at my other antique and vintage clothing and accessories. Combined shipping is offered. Condition: tiny holes throughout the dress and top. A hoop was so far out of style by the point this dress was being worn it would be like wearing your hot pink plastic charm necklace with your crimped hair and a modern 2010's flared hoodie sweater dress. It just does not work. The flared fluffy sleeve caps over the real sleeves are a very 1897 thing. I love the print - it looks like something you'd find in a thrift store or like Mom's old kitchen curtains. Vintage, but not antique.